VisiPics does more than just look for identical files, it goes beyond checksums to look for similar pictures and does it all with a simple user interface. First, you select the root folder or folders to find and catalogue all of your pictures. It then applies five image comparison filters in order to measure how close pairs of images on the hard drive are. All detected duplicates are shown side by side with pertinent information such as file name, type and size being displayed. Its auto-select mode let you choose if you want to keep the higher resolution picture, space-saving filetype, smaller filesize or all of the above. If you are insecure over what you really want to delete you can manually select the images you don't want to keep and delete them yourself. VisiPics is Free! If you like and want to support it, donations are welcome. image files are a lossy format. 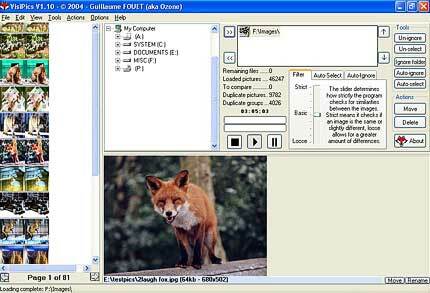 The DOS filename extension is JPG , although other operating systems may use JPEG . Nearly all digital cameras have the option to save images in JPEG format, some at different compression levels, such as “fine” and “standard.” The JPEG format supports full color and produces relatively small file sizes. Fortunately, the compression in most cases does not distract noticeably from the image. But, JPEG files do suffer generational degradation when repeatedly edited and saved. These files are best kept in original form. Because of the compression algorithm “artifacts” (blemishes) sometimes appear. is limited to an 8-bit pallete (256 colors). As a result, it is not used for photographic work. It is still used extensively on the Internet because of the great reservoir of GIF images available, and because it supports animation. But, is being superseded by the PNG format. The GIF format does well with images having 256 colors or fewer. It is not at all suitable for photographs. does almost everything that the GIF format does and does it better. The PNG file format supports true color (16 million colors) whereas the GIF file format only 256 colors. PNG excels when the image has large areas of uniform color. The lossless PNG format is best suited for editing pictures, and the lossy formats like JPG are best for storage because of smaller file size. Many older browsers do not yet support the PNG file format. The Adam7 -interlacing allows an early preview even when only a small percentage of the data of the image has been transmitted. is used internally in the Microsoft Windows operating system to handle graphics images. These files are typically not compressed resulting in large files. The main advantage of BMP files is their wide acceptance and use in Windows programs. Their large size makes them unsuitable for file transfer. Desktop backgrounds and images from scanners are usually stored in BMP files. uses a simple form of run-length encoding (a type of lossless compression algorithm). It was the native file format for one of the first popular DOS graphics programs for early PCs. Most PCX files use a color palette, but the format has also been extended to allow 24-bit images. PCX was quite popular on early DOS and Windows systems, but is nowadays rare, having been largely replaced by formats which support better compression, such as GIF , JPEG and PNG. is mainly for storing raster images , including photographs and line art. TIFF is a popular format for high color depth images, along with JPEG and PNG. TIFF format is widely supported by image-manipulation applications, by desktop publishing and page layout applications, and by scanning, faxing, word processing, optical character recognition, and other applications. is a raster graphics file format . It was the native format for some of the first graphic cards for IBM-compatible PCs to support truecolor display. TGA files commonly have the extension ".tga" on PC DOS / Windows systems, and ".tpic" on older Macintosh systems (Mac OS X uses the .tga extension). The format can store image data with 1–32 bits of precision per pixel. Color data can be color-mapped, or in directcolor or truecolor format; optionally, a lossless RLE compression can be employed. The TGA file format was originally in 1984. Several enhancements such as "postage stamps" (better known as thumbnails), an alpha channel, gamma value, and textual metadata were introduced in 1989.
contains minimally processed data from the image sensor of a digital camera or image scanner. Raw files are so named because they are not yet processed and ready to be used with a bitmap graphics editor or printed. Normally, the image will be processed by a raw converter in a wide- gamut internal colorspace where precise adjustments can be made before conversion to an RGB file format such as TIFF or JPEG for storage, printing, or further manipulation. These images are often described as "RAW image files" (note capitalization) based on the erroneous belief that they represent a single file format, and thus deserve a common filename extension, .RAW. In fact there are dozens if not hundreds of raw image formats in use by different models of digital cameras. This page was last modified on 15 March 2015, at 22:40. This page has been accessed 2,555,945 times.